Marshall's is my go-to clothing store because I like saving money, and I like buying unique and quirky pieces for my wardrobe. (I'm not into brand names or designer labels.) I may go there for the clothes, but my absolute favorite thing to do during my shopping trip is to look at their weird snack and condiment aisle. It's always filled with unique treats that I have never heard of, and they usually have great packaging. I have no idea why Marshall's has this aisle, it honestly makes no sense, but I'm not complaining. I Love it! My most recent Marshall's trip was unsuccessful in the sense that I couldn't find any jeans that fit (flares are coming back in style again? Seriously? ), but I did find a handful of cool snacks to review. Out of all the items on the shelves, this bag of chocolate coated bananas caught my eye right away. The green and dark brown color palette compliment one another and create a earthy feel, but it was actually the giant fruity images that caught my eye. I love food imagery (hence the food blog), so I'm an absolute sucker for packaging that features large images of food, or in this case, fruit. Mix that beautiful banana photo with a well designed logo and a simple layout, and I'm sold. I love this design and everything about it. The colors, the simple layout on the front, and the well put together information on the back. Then again, I love bananas, and I love seeing this color green in design work, so I could be a little biased. Still, I freaking love this design! Let's hope the product inside is just as good. 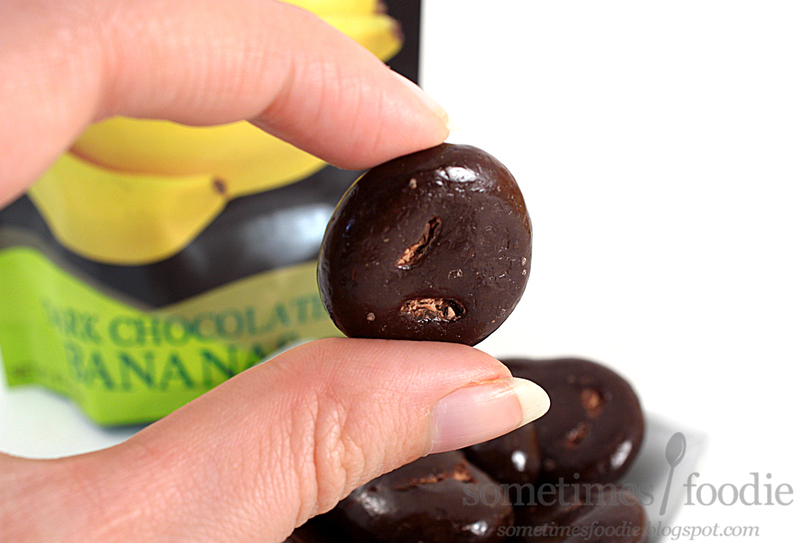 The banana slices inside are coated in a very generous amount of dark chocolate. I mean, the banana inside these things have to be freeze dried, or dehydrated, or something, right? 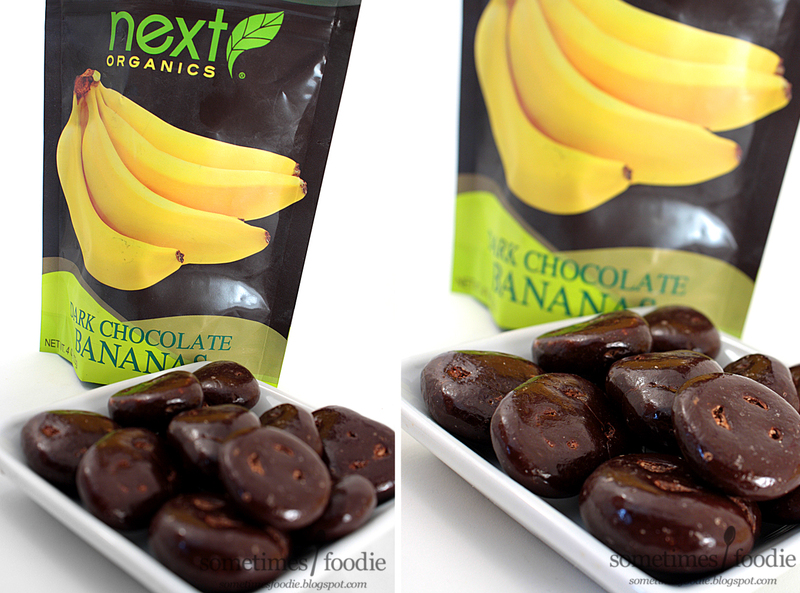 You can't just slice a banana, dip it in chocolate, and have it be okay on store shelves. I'm guessing the fruit portion of this snack must be small, like a typical banana chip, but these coin-shaped snacks are pretty hefty. I took a bite, expecting the inside to be crunchy, but WOAH...it's chewy! I honestly wasn't expecting that. 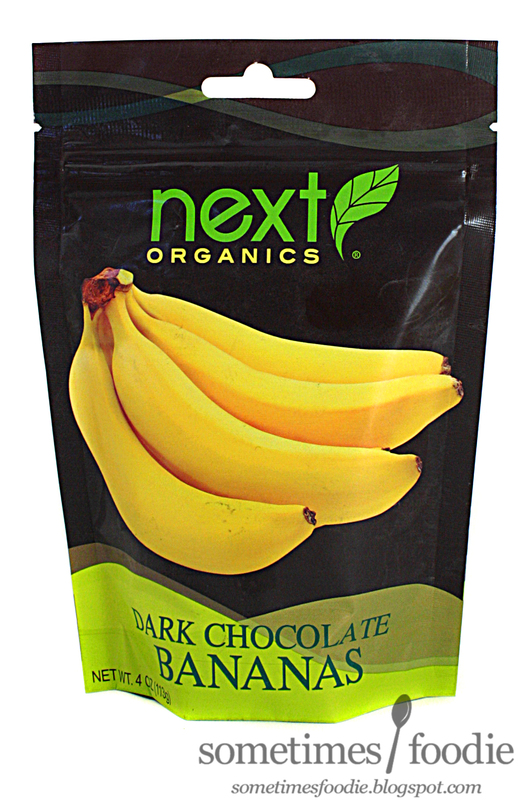 The dark chocolate outside is lightly sweet, a little bitter, and tastes more complex than your go-to chocolate coating for frozen bananas, but really, the chocolate takes a back seat to the banana. How did they do this? Are they witches? The banana is sweet, with a hint of green-banana-tanginess, and it's chewy. Kind of like a banana version of raisins. 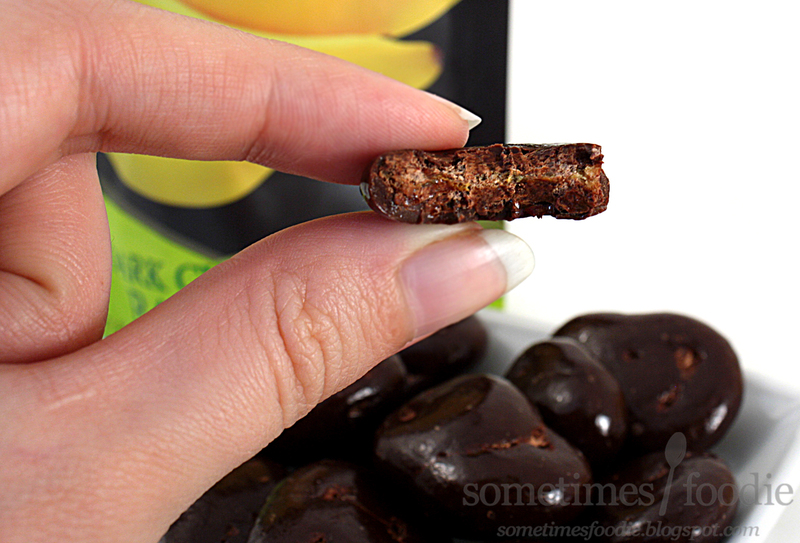 However they do it, these chewy chunks of banana are absolutely wonderful. They're tangy, fruity, and a little bit caramelized. I almost wish that there was less chocolate so that I could just enjoy the banana flavoring, but the two flavors really do work nicely together. Wow! I almost wonder if those stats could be wrong. 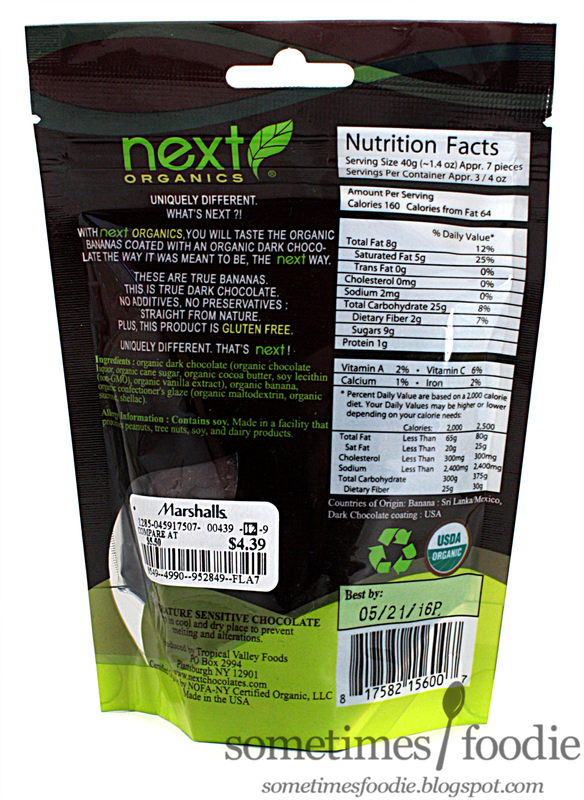 How could bananas (one of the highest sugar fruits around), dipped in thick chocolate, have only 9g of sugar? Either way, if I see these around, I'm going to grab a bag for sure. I'm not entirely sure myself (I'm no foodie scientist) but these were really delicious. If I see them again I'm definitely buying another bag. Hopefully you're able to find out too!